F.I.R.S.T. For Inspiration and Recognition of Science and Technology. You may have noticed we are sort of robocentric-techie-geekie-fully on board FIRST fans... especially FIRST 2102 Team Paradox fans. It's a natural fit for a family that likes innovation, creativity, design, engineering, science, art, building, making, sewing, painting, welding, milling, laughing, cheering, dancing, eating, animation, programming, invention... gee, who wouldn't find a reason to love FIRST? Participating in the Team Paradox Robotics Club is not a family obligation. There is no coercion. But it does make our days easier and more fun, when from about November through April, everyone has some interest, patience, and a role to play in the action. 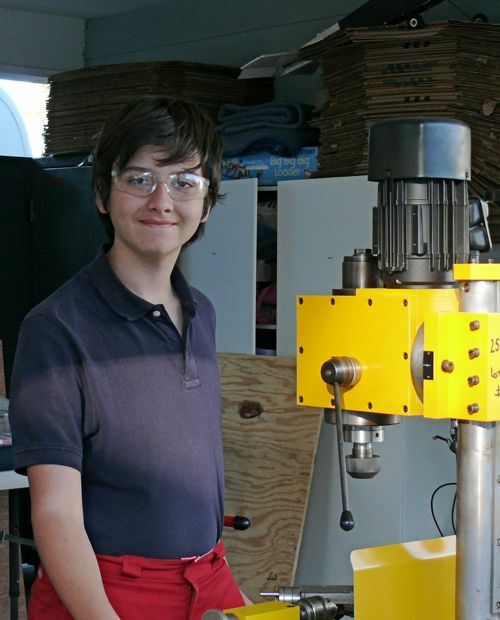 For Alex, it's easier... he goes to the school where the Robotics Club started, he is on the Team. He is definitely at the heart of our interests in robotics. He is one of our greatest Inspirations for loving FIRST. Maria has found her own means of participating, and she could not be a bigger-happier-more dedicated Mini-Parrot-Ox! Geoff and I mentor, and facilitate, we go to the supply stores, and we cheer enthusiastically. William has never missed an FRC event, and he has always been a quietly supportive participant, often facilitating the work that Geoff and I do, by taking care of the home-front. Even better though, this year, William has found ways to join in the fun through build and design. William was a big contributor to Lavender's construction. And more recently, he has been assisting in the construction of field elements for LOGOMOTION, and milling parts for the mini robot. He is a wonderful asset. Max is our quiet Parrot-Ox. I mean, considering the wild, pumped up, spirited intensity of FRC events and the longevity, hard work, and socially interactive nature of an entire build-competition season, it's a miracle Max has not disowned us, sought adoption from a family of librarians. He has unique needs and interests, and we have been sympathetic about how to make robotics comfortable for him, and we have been grateful to him for his willingness to participate, in spite of his discomfort. But we have found something... or should I say Max has found something. Geoff got him on the mill, taught him safety and operating, had him in closed toe shoes, with goggles, and those FIRST 2102 PANTS! 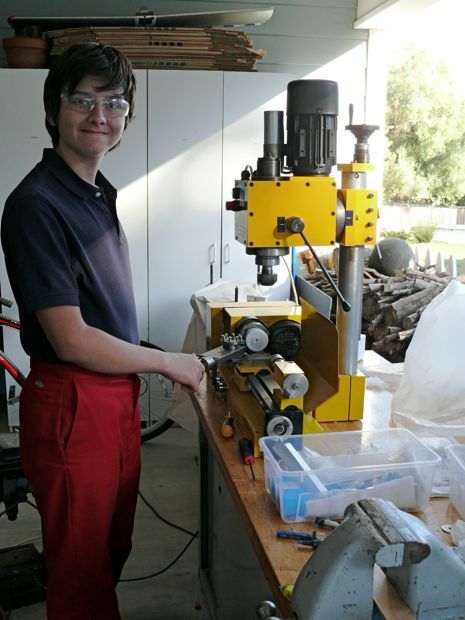 And Max began lathing wheels for the mini-bot! He asked me to watch him. Love this! Look at that smile! Love this! He wants to get his friends involved, share skills, spread the Paradox Spirit! Love this! He asked about mini-bots, and the competition, plans, what's next... he wants to know how soon we can build more mini-bots! Love this! I think we may have successfully recruited one more bright and beautiful robotics kid! Love this! Y'know, the first thing I thought when the first photo loaded was how nice Max's smile is. Like a happy contented smile. So glad he's found a niche. That is just cool beyond words. Geeks rule, and now you have... What, a geeklet? Geekling? Whatever, it's great. The last with the shy smile speaks volumes. Just found your blog and what a surprise to read about FIRST. Our family loves our high school robotics team - my daughter was on the team for 3 years, mentored during college and is now an assistant coach for Team 341, Miss Daisy located in Ambler, Pa. Good luck with your competitions! This is just wonderful. I think your family must be a great place to grow up. p.s. I saw in Jeanette's comment about the team in Ambler, PA. That's where I used to live, and I miss it so much! It's a great place. You have a good eye Nikkipolani. Max's expression can say a lot about how he is feeling, and these images capture a genuine joy. Team Miss Daisy!!! Cheers! We met Miss Daisy at FRC San Diego, in 2009, and last year in Atlanta. They are awesome. Truly an epic team, which is well documented, but it's nice to know it from personal observation. Jeanette, thank you for visiting Chickenblog, and for sharing your comment. I am delighted to have connected with you, and I hope you will come by again soon. Jennifer... thank you. I know you recognize that look, and the feeling it gives parents when they see it on their child's face... utterly fantastic indeed. Judy... thank you. Chickenblog is a nice place to emphasize the positive. I hope we get most things right, most of the time. And isn't it amazing to make these connections? Ambler, PA... has to be great if You like it, and for sure they have an amazing robotics team! Our paths have crossed - I traveled with the team to San Diego in 2009 and to Atlanta last year. Will keep my eye on Team 2102! Jeanette... then it's true: It is a small world after all! This is delightful to me. Where is Team Daisy traveling this FRC season? I am sure they will be in St Louis, right? We hope we earn a spot there, and I will have my eye on those Gracious Daisies!